We undertake all types of cartoon painting for play school class rooms, preschools classroom walls, kindergarten school classroom walls, Nursery Schools class room walls etc & creates a new atmosphere for kids every day as it gives them a fresh feeling in their room walls and it is also educative. Preschool or Playschool or kindergarten schools can contact us for their school class room wall paintings. We have many years of experiences in this field and all our artists are professionals & these services is run by a reputed firm. 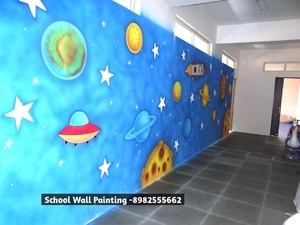 We have completed various preschools or playschools class rooms wall paintings. Our price are very attractive but we do not compromise in quality work and we used branded water proof water, which means it is washable.